Scroll down, Click here, or Press End to jump to latest SHiFT Codes! Locate The Golden Mysterious Loot Chest in the city/area of Concordia (i.e. 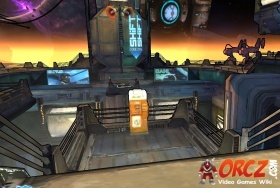 where you are when you enter the game in Concordia or use a Fast Travel station). 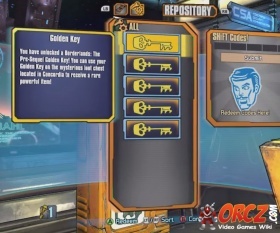 A golden key is consumed every time you open the Golden Mysterious Loot Chest, and your golden key amount is saved across all of your characters. SHiFT Codes are special day promotional codes released by Gearbox Software and other sources, some of which only are active for a few hours. Guns, Shields, and even Oz Kits! Some SHiFT Codes have limited quantities and no longer work after a certain amount of people have used them. Other SHiFT Codes expire after a certain amount of time. To make sure you do not miss any SHiFT Codes, bookmark this page and check often! SHiFT Codes may eventually expire. When a code expires, DO NOT REMOVE ANY CODES. Only mark that the codes have expired in the expected expiration section. If a code is past its expiration date and still works, please change the "Expected Expiration" to "Unknown"
Using a Golden Key to open the Golden Chest will give you at least one Epic item (Purple in color). Each time you open the chest you will receive one to four items depending on what items are available, similar to how loot chests work in the rest of the game. Any item that comes from the chest is scaled to the level of the person who opens the chest. The minimum level that the items can be however, is 7. For example, if a level 4 opened the chest the gear would be level 7, while if a level 42 opened the chest it would be level 42. NOTE: The chest will never spawn Pearlescent gear (Cyan in color), Legendary gear (Orange in color), E-tech weapons (Dark Violet/Magenta in color), nor Glitch weapons (Pink in color). Please use Talk Page for suggestions. SHiFT codes may (and usually do) eventually expire. However, when a code expires, DO NOT REMOVE ANY CODES! When a code is entirely deleted, you are not contributing, you are removing historical references, and you are just deleting keys. Make sure you have read the general guide at the bottom before you edit ANYTHING. When a code for a particular platform expires, only mark "Expired" (next to that platform) in the "Expected Expiration" column. Please do not mark codes for other platforms as "Expired" unless you have personally attempted to redeem them, even following the "Expected Expiration" date, because sometimes 1 platform will continue to redeem while 2 others are expired. DO NOT ADD COMMENTS INTO THE SOURCE CELL! There is a limit of 999 keys per account. ENSURE YOU WILL NOT EXCEED THIS before redeeming a code. If you find new golden key codes anywhere, please edit the section below to share. At times, page may be protected to prevent editing. If this happens and you have new SHiFT Codes to add, or if you are otherwise unsure of how to edit this page, please post the new codes to the Talk Page. Some codes are limited quantity, or expire after a few hours. You can bookmark and return here often for new codes so that you don't miss any. Codes valid on PC/Mac/Linux can be copied, then pasted right into the game's edit fields. Be sure not to include a trailing space or new-line character at the start/end of the code. Likewise, please ensure there are no trailing spaces before/after codes when adding them to the table below. Codes valid for PlayStation can be applied to a SHiFT account on PS4. Codes valid for Xbox can be applied to a SHiFT account on Xbox One. For the class mod SHiFT codes, the items will appear in the backpack of, and be the same level as, the first character loaded after code redemption. 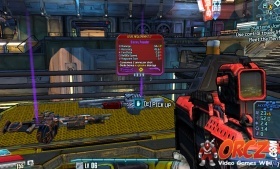 If the character is above Level 51, ensure you are in "Ultimate Vault Hunter" mode to receive the item of the appropriate level. SHiFT codes are not case-sensitive, and may be entered in upper or lower case. 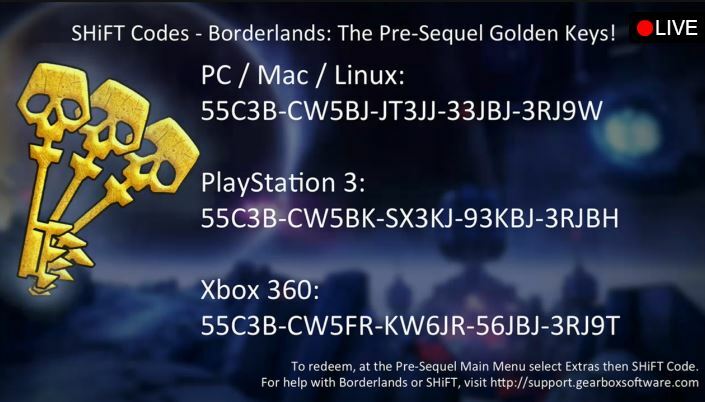 Simply bookmark this link: Borderlands Pre-Sequel: Newest Golden Keys and it will bring you down here. Alternatively, pressing the END key will do it from anywhere on the page. This page was last modified on 23 April 2019, at 13:19. Content is available under Creative Commons Attribution Non-Commercial Share Alike unless otherwise noted.